Take your Impressive Premium Resort & Spa Punta Cana vacation to the next level with premium all-inclusive offerings. Independent entry with private parking, reception and lounges, welcome gift, room and concierge service, late check-out, free Wi-Fi and more, are exclusive perks. Enjoy the same multi-generational leisure activities and entertainment as other Impressive guests, along with the on-site nightlife at the live theater, casino, restaurants and bars. Beach, garden and pool activities appeal to a variety of land and water interests. Make time to rejuvenate with a beach massage, spa Turkish bath, and gym workout to stay energized for an activity-filled vacation. 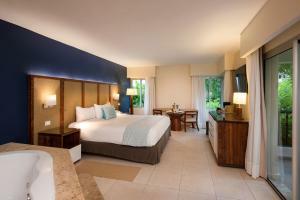 255 Junior Suites are fully equipped to offer comfort and functionality with garden, pool or ocean views.